This exhibit includes nearly 400 photographs of Icelandic emigrants, illustrating portrait photography in North America during the time of the westward migration (1870-1914). 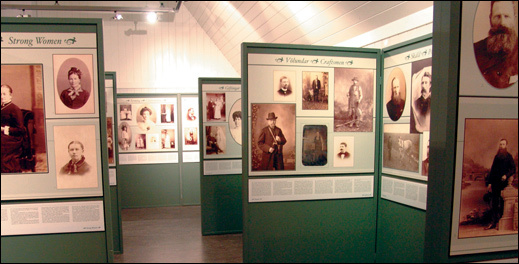 Nelson Gerrard, historian and genealogist of Icelandic descent from Manitoba, conceived of this exhibit, collected the photographs from all over North America and Iceland, and saw to the graphic design. Most of the subjects are named and their parentage and dwelling-place in Iceland given. Like modern-day Icelanders, the 19th century emigrants were enthusiastic about new technology. A great many had their picture taken and some actually became photographers. Most of the photographs in the exhibit were taken by photographers of Icelandic descent, and a photographer’s “studio”, texts, artefacts and pictures illustrate the art of photography at that time.